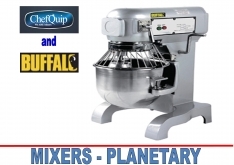 High Capacity, heavy duty, reliable mixer ideal for bakeries, restaurants, canteens and schools. Durable full metal body for easy cleaning with lever operated bowl lift. Safety stop activates if bowl or guard not fitted correctly. Supplied with whisk, dough hook and beater attachments. Dishwasher safe bowl, three speed setting and safety stop function.